Family & Friends Night, Unity Ribbon Fun Hunt is a collaboration between KidZania Kuala Lumpur and Projek57. Tickets can be purchased via email at kzkl.events @kidzania.com.my, directly at KidZania Kuala Lumpur ticketing counter or KidZania Kuala Lumpur hotline at 1 300 13 KIDZ (5439). 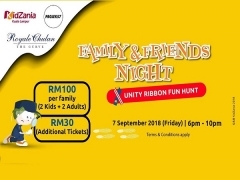 This offer is only valid for entry for the Family & Friends Night, Unity Fun Hunt event happening on 7th September 2018 (Friday). This offer is not applicable with other offers, discounts or promotions. Check out KidZania Kuala Lumpur for more details about this offer and to book your tickets now!